Who knew northern Luxembourg was so gorgeous, literally? 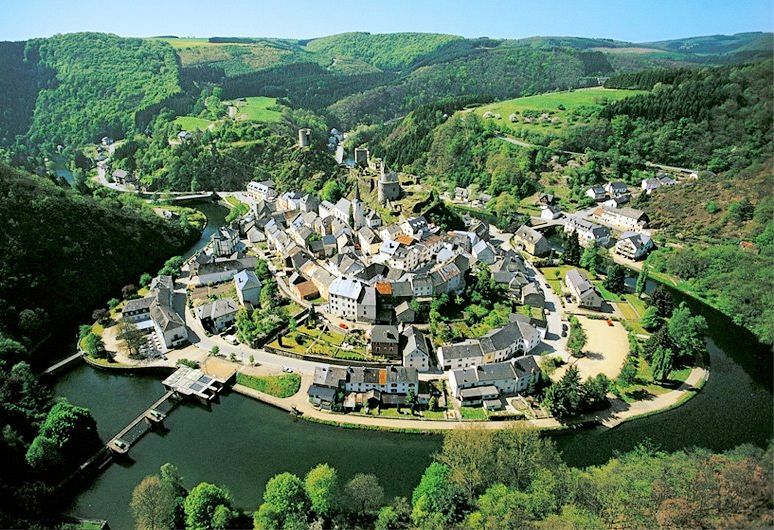 Esch-sur-Sure, on a steep-sided twist in the river, is particularly lovely: an unspoiled, charming village in the middle of quiet, rolling countryside. And only a gentle, three to four hour drive from Calais. For maps see below. Calais – Esch-sur-Sure, 230 miles. However you get to Esch-sur-Sure – the motorways via either Brussels or Lille are much of a muchness (see map below), it’s probably less congested via Lille – you end up on N4 from Namur to Bastogne. We’re becoming huge fans of the Belgian N road network: mostly dual carriageway, through the centre of towns and villages along the way, and much quieter – in our admittedly limited experience – than the corresponding motorways. N4 shadows the A4 Brussels-Arlon-Luxembourg but veers away north to Bastogne. 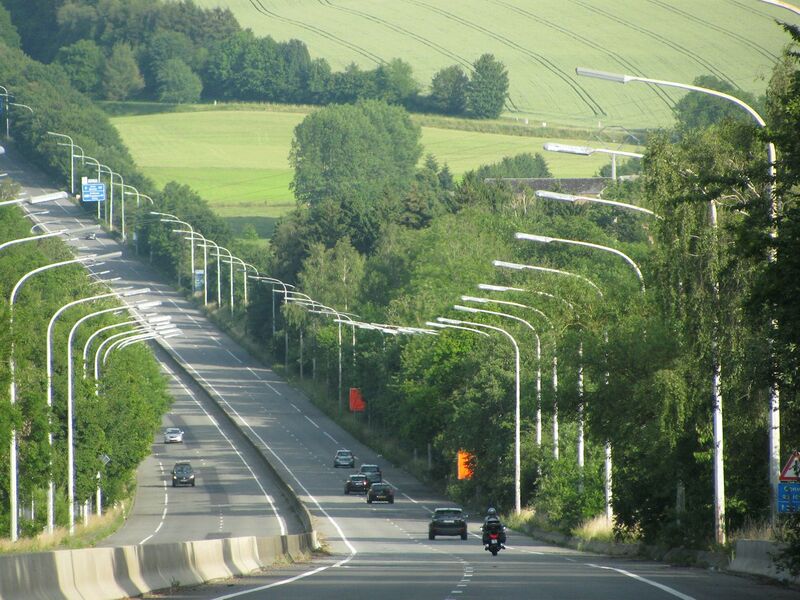 Rolling along through the Ardennes farmland and forest, N4 is a particularly fine example of the breed. It turns single lane at the Luxembourg border but there’s only another twenty minutes to go. Ta da! 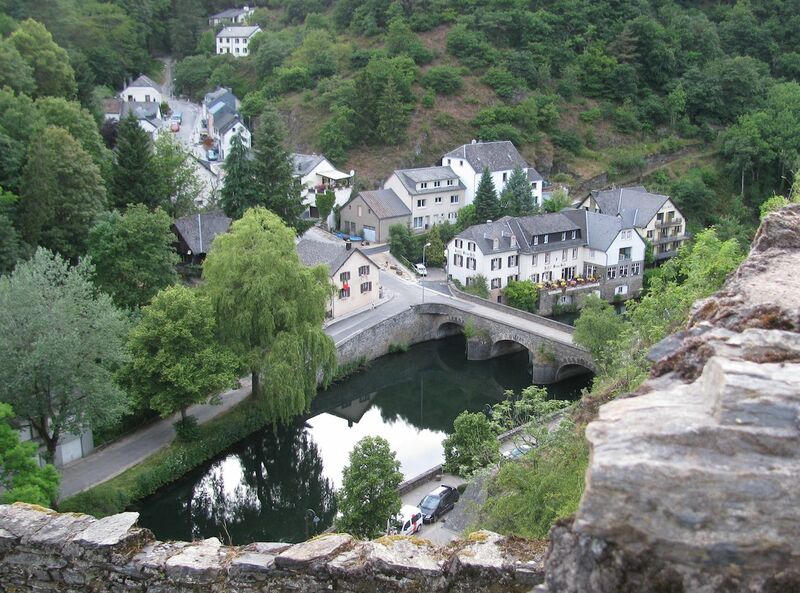 Esch-sur-Sure, tucked into a tight meander of the river Sure. Not to be confused with Esch-sur-Alzette in south west Luxembourg. This photo by visitluxembourg.com. All others by @DriveEurope. Believe it or not, the square tower of Esch-sur-Sure Castle was built in 927. It’s an obvious place for a stronghold, naturally protected on three sides by the river with a steep, slate spur in the centre. It fell to ruin in 1685 on the orders of Louis XiV. Looking west. 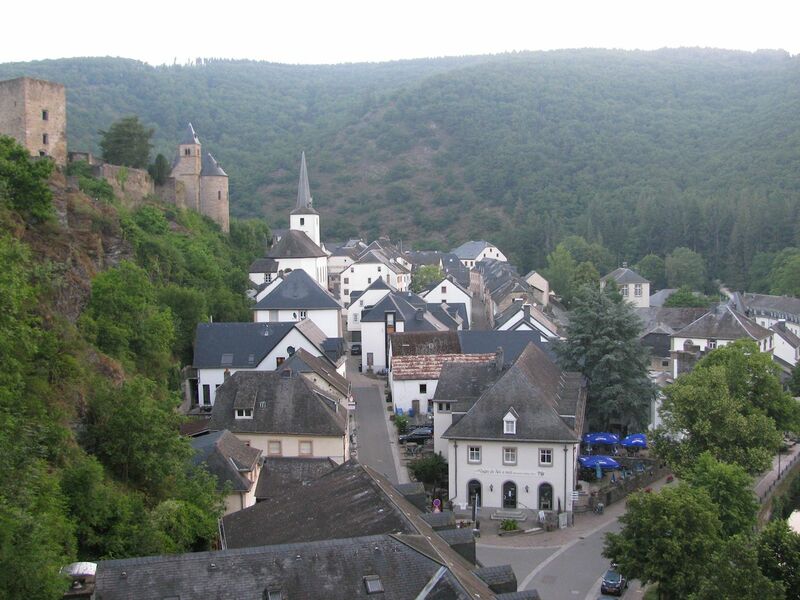 Despite being an obvious tourist destination, Esch-sur-Sure is hardly over-endowed with hotels. We tried to book into Hotel Beau Site, centre right, with a river terrace, but they were full. Double B&B €96-130, beau-site.lu. There’s also the Hotel de la Sure in the centre of town which looks lively – €29.50-92.50 per person, Hotel-de-la-Sure.lu – and a riverside campsite on the road into town, Camping “Im Aal”, camping-im-aal.lu. Looking north east. It’s the kind of place you wouldn’t be surprised to find Chitty Chitty Bang Bang’s the Child Catcher. Mountainous, central European, with a strong sense of peaceful, neat, orderly lives lived for centuries. 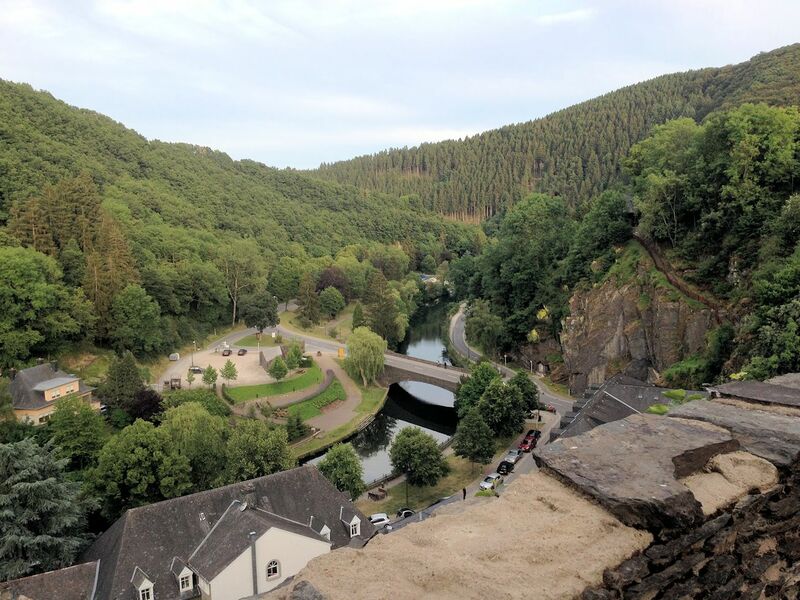 Geologically, the Ardennes are the western extension of the Eifel Mountains in Germany (around the Nurburgring) – forests, rolling hills and ridges, mainly in Belgium but also Luxembourg, France and Germany. 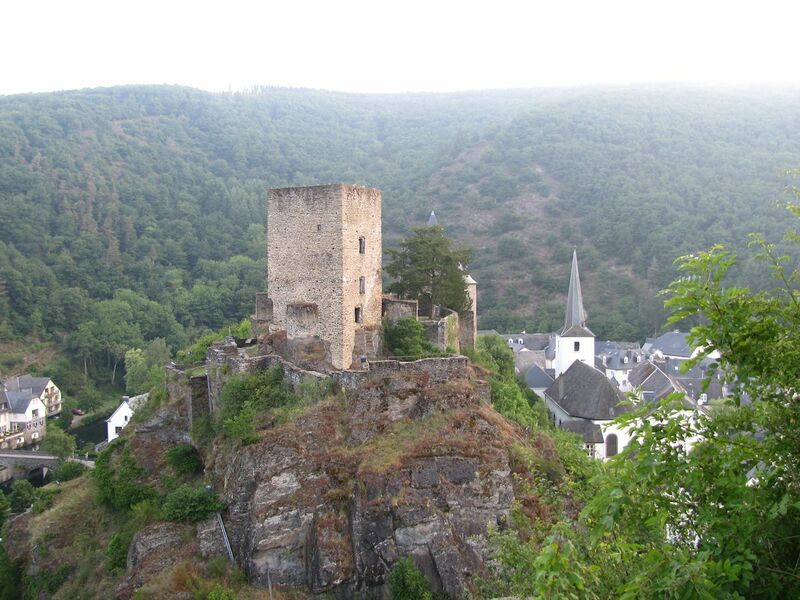 The Luxembourg Ardennes are known locally as Eisleck or Oesling. Looking east. 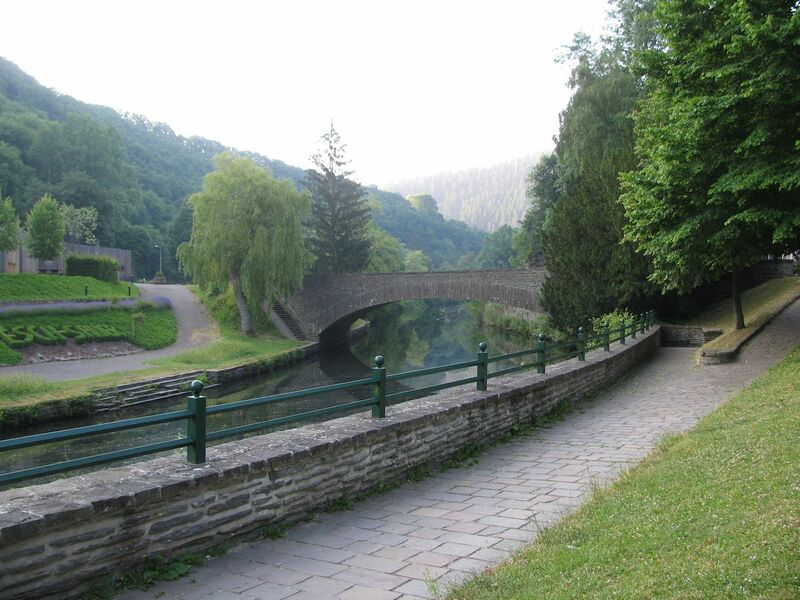 The Sure River – or Sauer – rises in the Ardennes, eastern Belgium, and forms stretches of Luxembourg’s borders with both Belgium and Germany as it flows east to the Moselle near Trier. Just upstream is the vast Upper Sure Lake, a 10km long hydroelectric reservoir which also supplies Luxembourg’s drinking water. Swimming and sailing is allowed but motor boats are not. 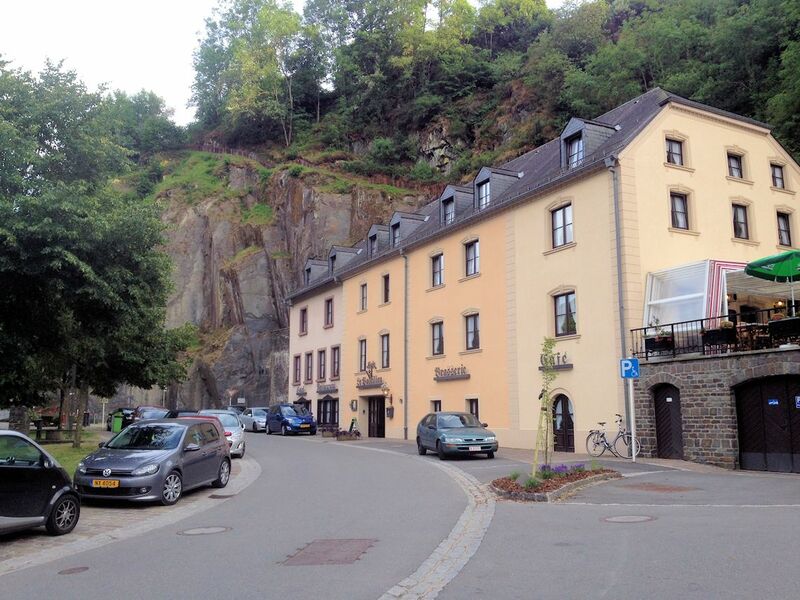 Really surprised Esch-sur-Sure (also Esch Sauer or Esch am Lach) is not overrun with chichi health and wealth tourists, shopping for art and antiques, eating fusion food, skittering around the hillsides and staying in boutique spa hotels. Physically it’s that kind of place. Actually, it’s a hybrid village/resort for normal people, resolutely unimproved, just naturally beautiful. And cheap. We eventually stayed at the Hotel-Restaurant Le Postillon just off the main road through town. A river view twin cost €84 B&B. Dinner on the terrace was €55 for a couple of OK steaks, beer and a carafe of house white. No-one spoke English but they were perfectly happy to muck in with sign language. The room was dated but clean. Just behind are steep steps up to the castle, carved out of the rock face. Where next? 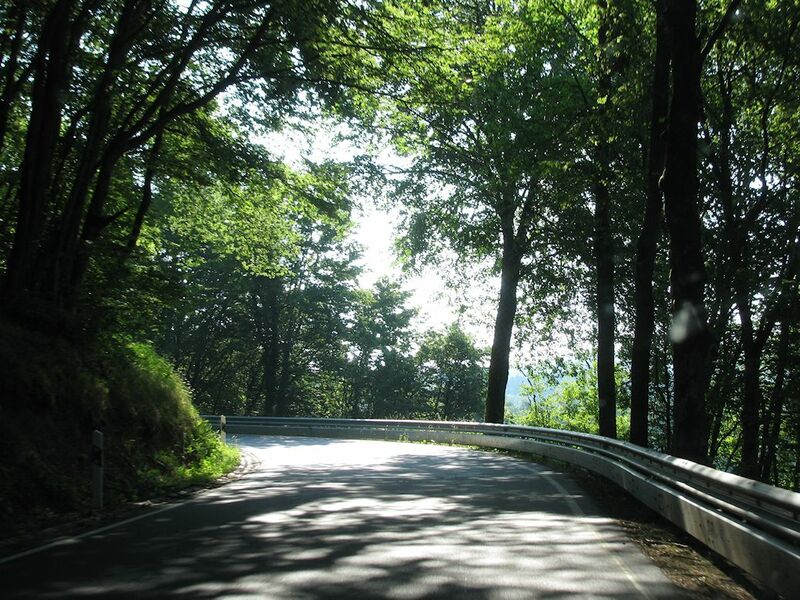 There are lots of tree-lined squiggly roads around northern Luxembourg. It’s a great place for relaxing, gentle drives through the countryside. Particularly interesting is RN27 west from Esch-sur-Sure along the southern bank of the river. Really though just take your pick. In the event we headed east on the deserted R27 to Ettelbruck then on to Bregenz in western Austria, arriving mid afternoon.